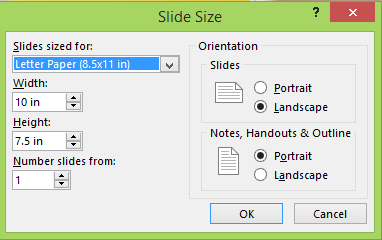 You might want to change the size, shape, or orientation of your slides for presentation or to simplify printing. You can choose landscape, portrait, or custom page setups as fits your needs. On the Design tab, in the Customize group at the far right end, click Slide Size. 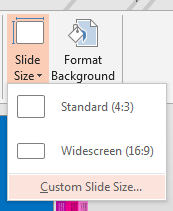 In the Slides sized for list, click the size you want to use, or use the Width and Height boxes to select custom sizes. 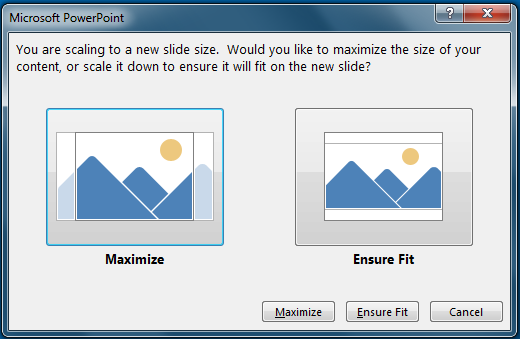 PowerPoint now asks you to choose between maximizing the size of your content on the new layout (to do this, click Maximize) or scaling it down so that all of the content fits into the new layout (to do this, click Ensure Fit). Note: If you choose to maximize, some content might fall outside the print margins. Note: Unlike Word document pages, PowerPoint slides don’t have margins that you can adjust to change the slide layout. Your slide stretches from edge to edge. When you print the slides, printer limitations can result in a white edge around the slides. However, you can change the margins inside Text Boxes and Shapes. Although wide format landscape presentations are most popular, you might find that your slides work better in vertical, portrait mode. Note: You can change the orientation of the entire presentation only, not individual slides. On the Design tab, in the Customize group, click Slide Size. 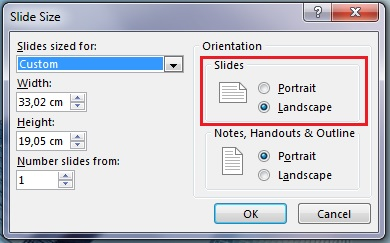 Change the orientation for the slides to Portrait or Landscape. Note: You can also change the orientation of your notes, handouts, and outline. Note: If you choose to maximize, some content might fall outside the slide.